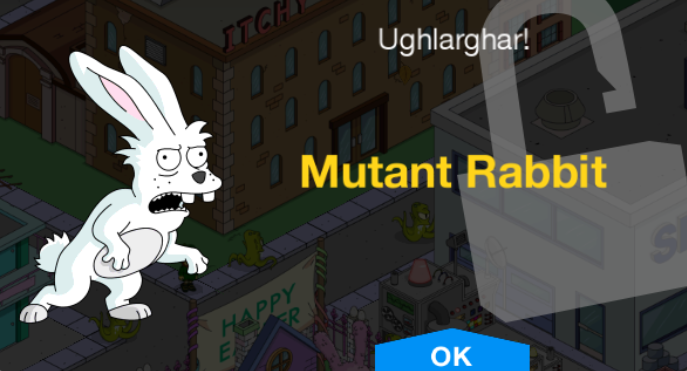 The Simpsons: Tapped Out Matt Groening/"Simpsorama" episode tie-in content update content update, is an episode tie-in update that was released on November 5, 2014. 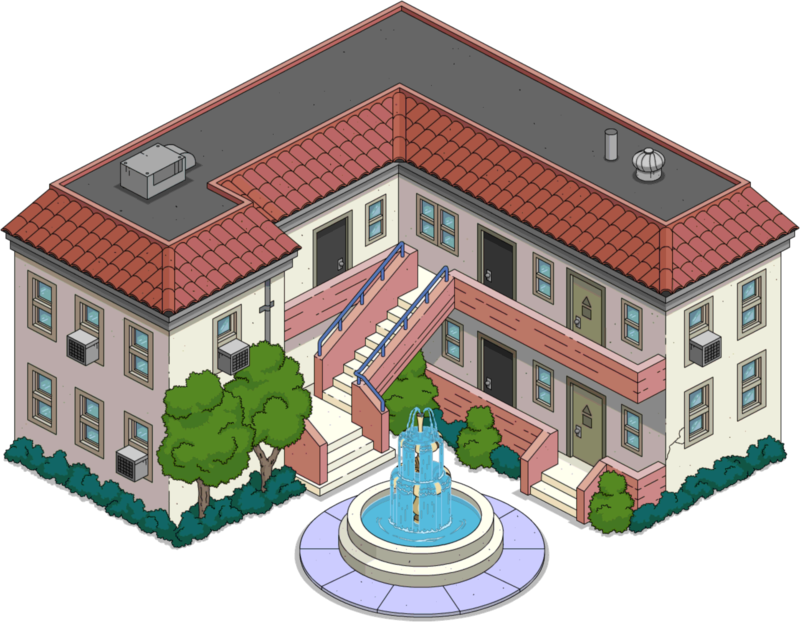 It came with the character of Matt Groening, along with the Writers Building for cash. 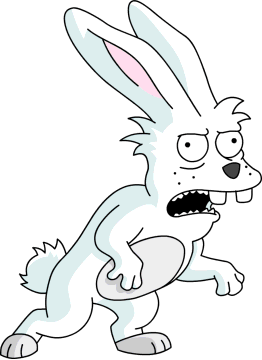 It also included the Mutant Rabbit, a premium character from the "Simpsorama" episode. The rabbit is only available until 8am GMT on November 11, 2014. Matt Groening and the Writers Building become permanent afterwards. 3.5 All Hail the Creator! 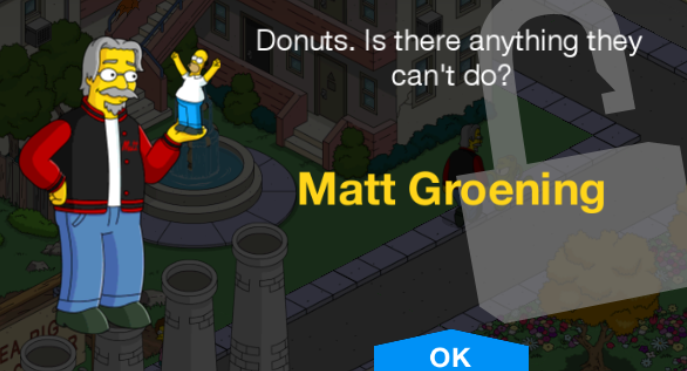 Matt Groening Unlocked with Writers Building Is in the character collection "Helpful Guest Stars". 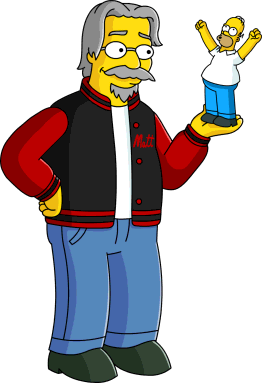 Writing for All the Characters (Level 48) Unlocks Matt Groening. Sorry, I've just always wanted to do that to someone and this was probably the only chance I'd ever get. What? No, I think we've had enough of those in this game already. No. I have a beard and walk around in a bathrobe a lot, but I'm not him either. I'm the creator of The Simpsons. Then maybe you should spell it that way. ...uh, can I just call you Matt? And I'm here because something wonderful is about to happen. Worlds are about to collide! Like Earth is going to crash with Earth-2, annihilating us all? No, The Simpsons is going to crash with one of my other creations, Futurama... annihilating TV-viewer boredom! You mean a crossover episode? Ugh! Those things are always so awful. Yes, they are full of awe. And this will be the most awe-full crossover ever! System Message Watch The Simpsons Futurama Crossover Episode this Sunday at 8/7c on Fox. O Great Creator of Everyone and Everything Around Us... if you can hear me, please answer my prayers. I can hear you, Homer... now that you've stopped screaming. What is it you want? For you to get rid of that crossover episode. Futurama had a great run, but it's over now. Can't we just let it go in peace? *sigh* I think I can fix things. But first I need you to build something for me. Of course, O great one! Is it an ark? Because if so, I need to know what exactly the difference is between an ark and a boat. No. I need you to build something to bring me into your world. A super sciencey time portal? A magic train to carry you here from your wizard school? A WRITERS BUILDING! I'M A WRITER SO I NEED A WRITERS BUILDING, OKAY? Okay, I built the Writers Building. It's old and crappy and doesn't have nearly enough offices for a show this size. Also I built a fountain in front and put fish in it, even though it wasn't made for that and most of them will die. then the player is taken to the character collection screen "Helpful Guest Stars", then receives the quest reward of 100 and 10. This Springfield seems different than the one I remember. That's because I blew up the one you remember. This is a new Springfield, built from the ground up by a giant finger. So this world was created with the help of others? Relax, Mr. Greening -- you still have "Created by" credit. Now that you're back, Mr. GRAY-ning, can you use your writing powers to get rid of that crossover episode? I'd love to, Homer. But first I need you to finish the Writers Building. I put super-cheap air conditioners in all the windows. What more do you need? ...the kind of energy you can only get from a cabinet full of candy and a refrigerator full of sodas. ...so that after a few restockings we'll have extras of everything people don't like, but not enough of what they actually eat. Great. But writers can't just live on snacks. Can't you just bring your lunch from home? What? No. We have to order out so that we can wonder all morning when lunch is going to get there. And then get mad if it doesn't arrive on time. It's part of the creative process. Thanks for the menus, Homer. I'm sure we'll be cycling through these same small number of restaurants for years. Now all we need are some PA's to take our orders. But we don't have any PA's. Also, I have no idea what a PA is. Their job is to call in our lunch orders and pick up our food. Can't we just call it in ourselves? Most of these places deliver. What is this, not Hollywood? I'm sorry, Homer, but this is just the way things are done. So Homer, did you get us PA's? Yep. I hired a bunch of recent college graduates who could make a fortune on Wall Street but for some reason would rather do menial work for very little pay. So are you ready to write that crossover episode into non-existence? Almost. We just need a few more supplies. What? Pens? Papers? Dictionaries and Thesauri? No, coffee. I need you to go on a coffee run. Why a coffee run? We have freshly-made coffee right here in the coffee machine. It has to be Starbucks. We don't drink the free coffee, Homer. IT'S JUST NOT THE WAY IT'S DONE! All right, I've gotten all the things you need to write. And I've got to say, it would've been a lot easier if you just gave me the whole list to start. Sorry about that. But I like watching you move around. Beautiful character design, if I say so myself. My eyes are up here, creep. ...a room full of other writers. I can't eat all this food myself. Not a bad writing staff, Homer. How'd you find them? It was easy. I just went to the same place I found the PA's and offered more money. Yes, Homer. We're ready to begin the rewriting process. Thank God! Bless you, Matt Grow-ening. I can't get it right, because NO ONE CAN GET IT RIGHT! Homer, you're a wonderful character. And that's why you love me. That's why everyone loves me! I'm the amiable goof, the id with a heart of super-ego. I'm your greatest creation ever! And that's why you have to destroy the Futurama crossover. So after spending days setting up your writing building, you're finally going to do some writing? You'll be happy to know that I rewrote the Futurama crossover. Thank you, Mr. whatever! No one wanted to see those two worlds collide. Why did you look so sinister when you said that. Because I decided not to get rid of Futurama, Homer. I decided to get rid of you. Get rid of me? But it's an episode of the Simpsons. You need me -- I do the jokes! Oh God, you really don't need me! No, and now it's time to get rid of you forever. But this is my show, and my game. You can't get rid of me just by writing. Maybe not. But I'm not just a writer -- I'm also an animator. Haha, that was great -- very Loony Toons-y. Thanks. And no hard feelings about the Bender over you stuff. Of course. We all liked Futurama. Sorry about it being cancelled. Eh, it'd been fourteen years. After that many years, any show has run its course. Hey Bart, look at this adorable bunny I found! Better be careful, Lisa. You know what rabbits are good at! Not really. I assume it has something to do with running fast and/or eating carrots. Lis, is that supposed to happen that way? Not really. I think there's supposed to be more than one, and that the whole process takes longer than two seconds. Ugh! That doesn't make it sound any better! Hmm, all the extra bunnies seem to go away every twelve hours. And all the Spucklers seem really well-fed every twelve hours. Weird, huh? It's almost like they're killing and eating them... which is fine, because the rabbits aren't me. Modified on July 15, 2017, at 13:23.